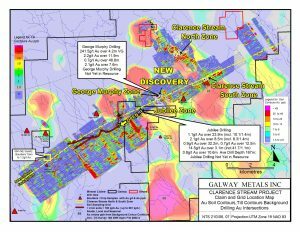 Galway Metals Intersects 807 g/t Au Over 1.25m From New GMZ Discovery - Galway Metals Inc.
(Toronto, Ontario, May 2, 2018) – Galway Metals Inc. (TSX-V: GWM) (the “Company” or “Galway”) is pleased to report partial assays results from hole GWM18CL-26, which Galway showed contained Visible Gold (VG) (VG Photos) (see April 19, 2018) in the recently discovered George Murphy Zone (GMZ) at Clarence Stream in SW New Brunswick (Figure 1). The GMZ is located 2 km east of the Jubilee Zone and 4 km west of the South Zone (Figure 2). The intersection of 807.0 grams of gold per tonne is located at the centre of a 300-metre gap between the two lines of drilling where the original discoveries were made. The original discovery holes returned intersections such as 2.2 grams per tonne (g/t) gold (Au) over 11.9 metres (m), 2.1 g/t Au over 7.6m and 0.7 g/t Au over 48.8m. The presence of visible gold is not indicative of the grade or representative of the mineralization hosted on the property. 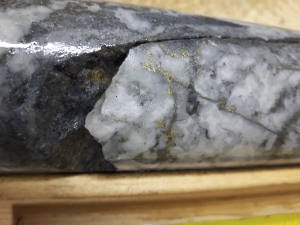 The new GMZ discovery was found by drilling in the immediate vicinity of a 700m long soil anomaly where boulders, which assayed 16.5 g/t, 11.5 g/t and 7.9 g/t gold were found by prospector George Murphy. These boulders are 100-300m south of the GMZ, and like the North Zone, the GMZ is located north of the major structure in the area—the Sawyer Brook Fault. The South and Jubilee Zones are located south of the Sawyer Brook Fault. Hence, gold deposits are hosted on both sides of the fault zone. Within the GMZ, there appear to be multiple veins that trend the same NE-SW direction as the Jubilee and South Zones (Figure 1). Figure 2 shows the location of the new GMZ discovery relative to other zones. Figure 2 also shows that there are many geochemical gold anomalies similar to the GMZ, Jubilee, and the South and North Zones, which Galway plans on drilling. Galway has achieved several milestones at Clarence Stream since it announced its acquisition on August 3, 2016, including the release of 116 drill holes and a 54% increase in the resource, which included the first-ever pit constrained resource on the property. The Company has also expanded the Jubilee Zone and made a significant new discovery at the George Murphy Zone, neither of which are included in the resource. 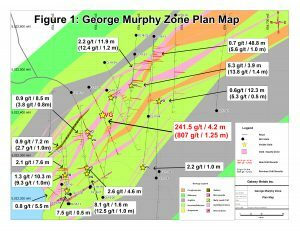 Looking forward, Galway plans on following up on the very strong results received from the George Murphy Zone, and then move the drill rig to expand the North Zone. Following these rounds of drilling, Galway plans on releasing another updated resource estimate. 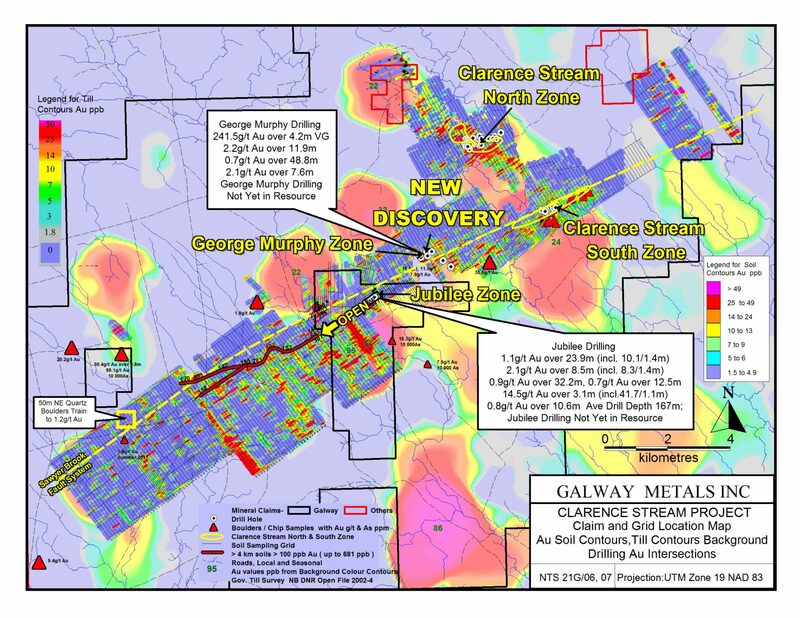 Prior to receiving the assay results reported in this press release, Galway had set 200,000-260,000 ounces as an exploration target for the George Murphy Zone. Parameters used in arriving at this target is that mineralization would be hosted within a 400m length by 400m depth area and consist of a 10m average width zone at 2.0 g/t from surface to 150m, and a 3m wide zone at 5.0 g/t below 150m. This was based on the first intersections received, and the presence of wide zones of quartz where narrower, higher grade intersections have been received. The potential quantity and grade is conceptual in nature. There is insufficient exploration to define a mineral resource; it is uncertain if a mineral resource estimate will be delineated. VG = visible gold. 0.42 g/t Au was used for the bottom cut-off; True widths are unknown. VG in hole 26 was assayed by metallic screens method (856 g/t by Fire Assay). 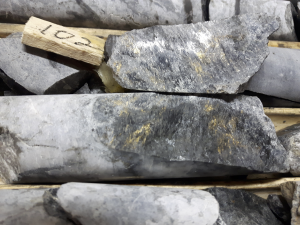 The blank sample following the 807.0 g/t assay ran anomalously for gold and the samples that followed (also part of the quartz zone) will be re-assayed but will not materially change the results. True widths are unknown at this time because dips are uncertain; the zone in holes 4 and 15 appear to be vertical while the quartz in holes 22 and 23 appear to dip at 75° north or south. The VG in hole 26, the 13.8 g/t in hole 22, and the 12.4 g/t in hole 4 all look like they are along the southern contact of a wide quartz zone. As well, multiple zones of quartz are present in holes 23 (4 zones) and 25 (3 zones), and a 30m zone is present in hole 24. The mineralization consists of 10-70% quartz stockworks and veins with 1-5% fine pyrite plus pyrrhotite plus arsenopyrite in sericite altered sediments. A more complete description of Clarence Stream’s geology and mineralization can be found at www.galwaymetalsinc.com. Galway would like to acknowledge financial support from the New Brunswick Junior Mining Assistance Program, which funded drilling of the GMZ. For holes 1-27 see Table 2. Visible gold disclosed in the photo is not necessarily indicative of the mineralization hosted on the property.